I have bought a used Lomart 18'X36' pool with 48" sides. We have decided we want to set it up as a single depth pool, but we would like it to be a little deeper than the 48" sidewalls would allow. 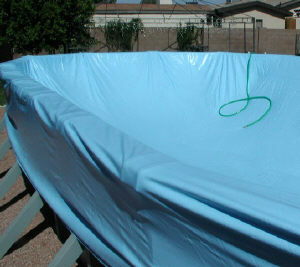 If we want a water depth of around 48-50 inches, I am wondering if we could use a standard overlap liner that would fit a 52 or 54 inch wall and install it with a dished out center, or would we have to use an expandable liner which is extremely expensive for this size of pool? Would one brand or thickness of liner be better suited to do this? Thanks! Hi Kip. This is a tough question to answer. In order to get four foot of water in the pool you would need to dig down about six inches. If you were in Arizona, on a typical 115 degree summer day, and stretching the liner in, this extra depth would mean nothing. 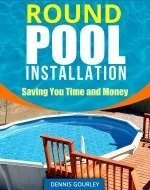 Opening up the liner on the inside of the pool and hanging it over the sidewall, not stretching it, on a cold winter day, could leave you short of liner even if no extra digging were done. liner. See this page for further info on stretching a liner. So, stretching a flat bottom liner into a pool that has been dug out four to six inches, on a warm summer day, with direct overhead sunlight, should never be a problem. This is especially true since you have a 48" wall and most liners will accommodate walls up to 52" or more. The extra depth is nice and I would not have a problem with doing it. You pool should be the strapless design. If it has straps going across the bottom, from side to side, you cannot do any additional digging. Assuming you have no straps you do need to keep this in mind before digging. Leave about a 3' ledge going down the sides and about 2' at the ends. This ledge is your pool level ground and will hold the pool structure and the pool cove. The side structures will have steel supports that extend into the pool by about 30". You need to be at least 6" beyond these supports before you start any digging. So have all of your side supports and end rails in place before you even think about digging out the center. The Doughboy UD 20 mil liner is my favorite. Lomart makes a good liner also. These are a little more expensive than other brands but a Doughboy UD liner is cheap compared to the expandable ones, and just as good, in my opinion.